We live in blistery cold Michigan and on any given winter day temperatures can range from being in the negatives to 50's. 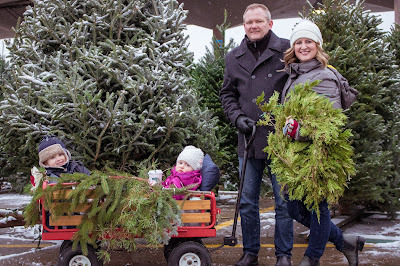 So when we scheduled to have our family pictures taken mid December I knew it was a gamble. On this particular day, we had snow and it was cold! I believe in the low 20's. Brr! Instead of coordinating matching outfits I had a different mindset when planning for our family pictures. I had to think gloves, hats, winter coats, and boots. While I did put a little thought in the under layer, I knew it would be hard to challenge us to get unbundled. With a 2 and 4 year old, getting dressed up for outside is time consuming so taking off our jackets was a stretch. Having family pictures comes with a lot of decisions. We need to choose our photographer, decide on a location, time of day, what to wear, and then we have to cross our fingers and hope the weather is on our side. The natural beauty the forest brings for photography is always consistent and it's easy to focus on the subject. 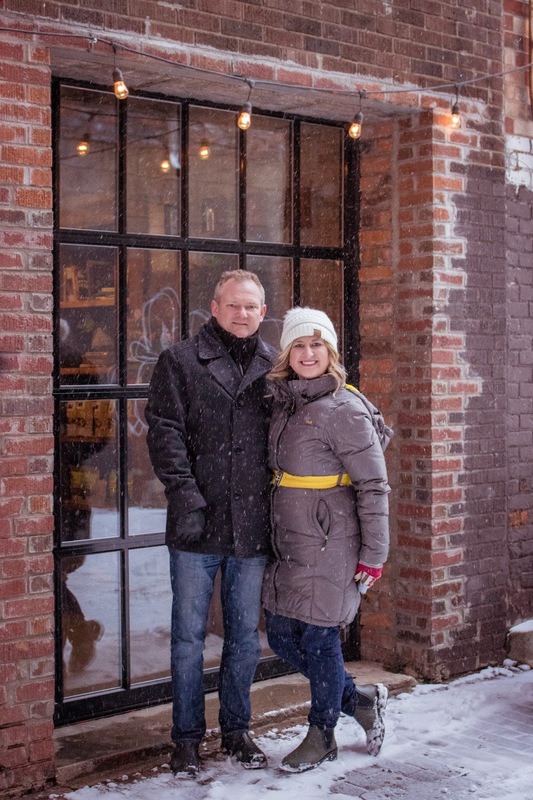 We've had many pictures taken in the natural setting but this time I wanted more than a family picture...I wanted the setting to resemble something more, something special, a place that represented us and where we are from. I love the energy of urban areas and Eastern Market in Detroit was our final decision on pictures. Urban settings come with many uncertainties. In this particular situation a car pulled up during our photo shoot. 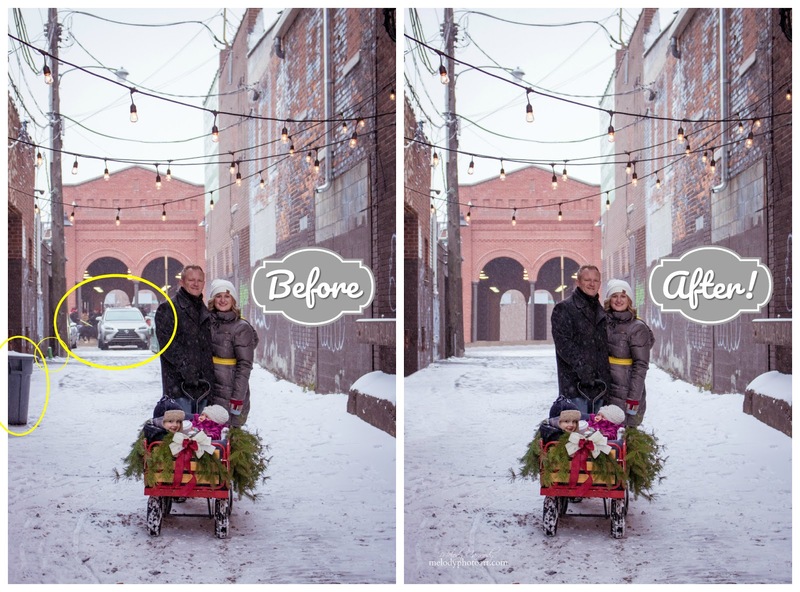 Thanks to editing, Melody was able to wipe the car away. There is action everywhere in an Urban setting so you need to be ok with the randomness which makes editing crucial but also makes photography exiting! When choosing a location for your family pictures think about the photo opportunities available within the setting. Can you easily change into different outfits? If not, what different backgrounds are available for you? 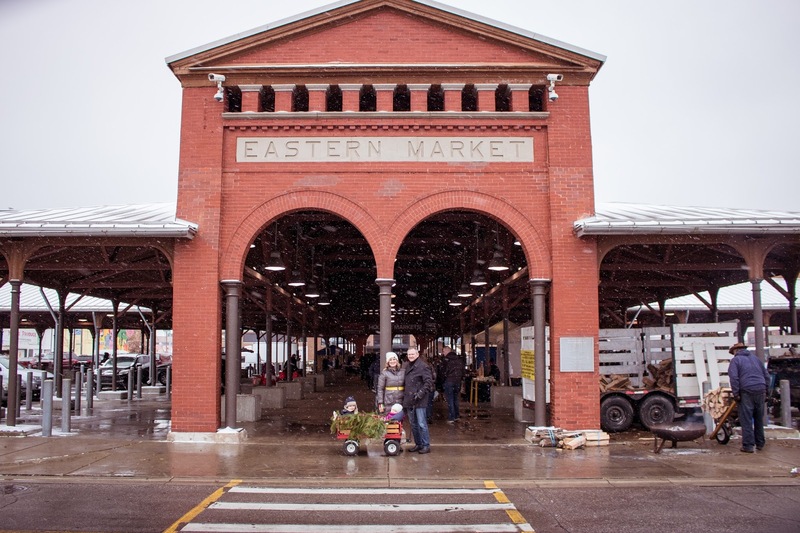 We visited Eastern Market in Detroit. Eastern Market is known for its history as a market and graffiti walls. I knew the graffiti walls would definitely provide us with fun backdrops. I like to decorate my home with family pictures and local art. It really provides me with a sense of community of where I live. It connects me to local artist and always has a meaningful story. As much as I love pictures of our family, we are forever changing and photos quickly become dated. When we choose a location that becomes the subject, we become a small figure within the photo. For example in the picture below you will find the building stands out more than us. This was exactly what I was looking for. A family photo with a sense of community. We have little kids so we knew we were pressing our luck when taking them out in the dead of winter for family photos... but they did great! Some of the things I would suggest bringing is hand warmers, dress with a base layer, and if you have little kids, consider bringing something to tow them around in. We decided to decorate our wagon as a prop and inside the wagon we were able to have a blanket for the kids to stay warm and best of all some hot chocolate! Finding a good photographer just got easier if you are in the Detroit area. I highly recommend Melody. Instagram is also a wonderful resource to use because you can see their work and a little of their personality shines through. I also recommend using Pinterest to gather tips on what to wear and where to have your family pictures taken. The internet provides a creative outlook for many so turn to blogs and photographers for ideas. Mellody has written a great blog post on what to wear the day of the pictures. You can check it out here. I'd love to hear from you. How do you decorate using pictures of your family? Do you have a family picture wall? We'd love for you to share below. That was a great photo editing job! Isn't there always something or someone getting in the way of a shot LOL! Wonderful family pics! I really liked your idea of taking them at Eastern Market. Thank you! 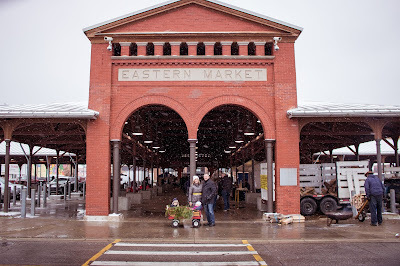 Yes Eastern Market is one of my favorite places to visit in Detroit so these pictures truly fit my personality. These are so fun! I barely got myself organized to take the pictures so we opted for in front of the house since it was easier. Next year I need to get ahead of it and take the pictures earlier so we can do something fun like this. Sometimes we just need to make due with the time we have! I thought your pictures were wonderful! Today is beautiful outside with the snow. I may have to take the camera out and get pictures of the kids in this winter wonderland. I love the fun graffiti wall backdrop! 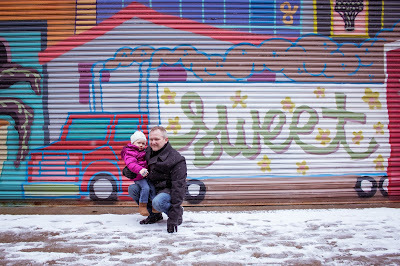 An urban setting is a great way to spice up family photos. Isn't it cool. Eastern Market has so many cool walls like this. What fun photos! They came out looking great! super cute photos and great suggestions!! Those are fun pictures. 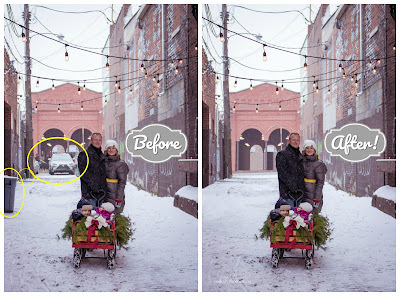 It is amazing what professionals can do with editing. I especially love that wall.